I’m always on the hunt for new fun activities to do with my students. I came across an awesome tool to help facilitate games for students who are cognitively or physically impaired. The tool is a spinner made by Ablenet, a company that makes many assistive technology devices, including communication devices such as step-by-steps and sounding boards, switches, and equipment needed to mount or position devices. The spinner (seen in the pictures) is large and can be activated by hitting a switch, which makes it perfect to use with my lower cognition or physically handicapped kids. I had an older version of the spinner but the new version is called the All-Turn-It-Spinner and can be found on the Ablenet website. This newer version comes with a dice overlay, so kids who can’t roll dice can use the spinner when playing games. This spinner is awesome because it can be used for so many games and fun activities! I used the spinner to involve the students in a game of Bingo. This was a fun activity to target social skills, language, and participation. As you can see in the pictures, I attached Mayer-Johnson pictures of food around the spinner. Each player took a turn to be the Bingo caller by hitting the switch to spin the spinner. We would then look at their Bingo cards to see if they had a match. We have been working on nutrition units and learning about food groups but any vocabulary can be used for a Bingo game like this. If you want your student to be working on taking turns and participating, then make a Bingo game using things they love. These could be characters from Pixar movies or favorite TV shows. Bingo games take a bit of prep work to make up the cards and pictures, but the versatility of the activity is worth it. The new All-Turn-It-Spinner has three ways to activate it: pushing a button on the spinner, using a switch that you plug into the spinner, or the fancy new wireless switches. The original spinner (seen in my pictures) can be used by pushing a button on it or plugging in a switch. Both new and older versions work really well. You don’t have to purchase any new switches; it’s best to use the one that your student is familiar with. 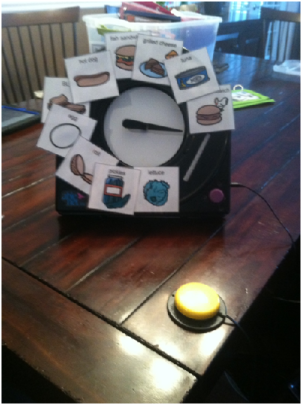 Taking turns in class or a group therapy session– attach pictures or the names of each student to the spinner and take turns pushing the switch or spinner to see whose turn it is. 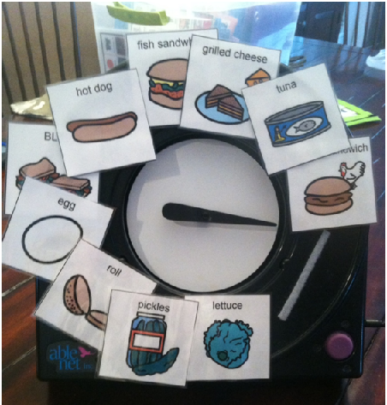 This can add a fun interactive piece to morning group or check in time at the beginning of sessions. Make your own dice overlay – if you don’t want to purchase the new spinner or the different overlays they sell, make your own! Answering questions – use the spinner for a social communication activity. Write different questions that the students must answer on their turn. Write the questions down on an index card or something similar and attach them to the spinner with velcro. Then each student takes a turn to spin and answers whatever question they land on. Making random choices – my group of lower cognition kiddos love to pick musical videos to watch on Youtube or switch accessible sites like Priory Woods. Stick pictures of video choices onto the spinner and have the kids use the spinner to select which one the group watches first. This does not target selecting which one they want because the spinner makes a random choice but it is working on participating and turn taking while being part of a group. Have fun with it and use your imagination to come up with new ideas for games! Tweet your ideas to us or go on our Facebook page. Sign up for our mailing list here to stay updated with our latest therapy tips, app announcements, and blog posts. Don’t forget to follow us on Pinterest!